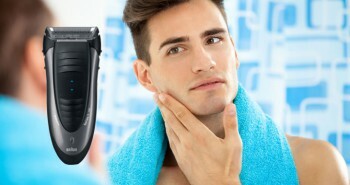 Many men like to have a clean smooth look on their bodies, just like a men’s shaver does for the face. Manscaping is now a popular activity. It’s especially important for a man to look good while body building, or participating in outdoor sports, or swimming and surfing activities. Yet, as many people know, sometimes shaving can be a chore. A men’s shaver may not be enough to tackle thick body hair. Braun is a well-known German maker of cordless electric shavers. The Braun Cruzer 6 Body Shaver is the best solution to removing stubborn body hair. 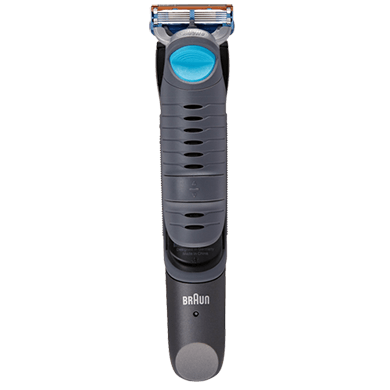 The Braun Cruzer 6 Body Shaver comes in a grey and blue plastic casing, and has a sensitive skin attachment. There is also a hook that can be attached, so you can hang your body shaver in the shower, if you wish. The Braun Cruzer 6 Body Shaver will make short work of smoothing away body hair. The Cruzer 6 is the perfect tool for men who’d like to try a cleaner and fresher look on their bodies. They may also notice how much cooler they feel in the summertime with a shaved chest or armpits. It’s not just women who can benefit from shaving anymore. The Braun Cruzer 6 Body Shaver was designed specifically for men’s body grooming needs. You won’t need to wear out your facial shaver on your body now, nor have to dig out scissors, or tweezers. 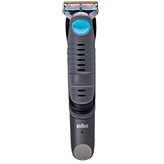 The Braun Cruzer 6 Body Shaver is completely cordless, and rechargeable, for your convenience. Braun has partnered up with Gillette. This body shaver is built with a combination of an essential body trimmer, with Gillette Fusion wet shaving technology, to deliver all-around body grooming performance. The Gillette blades contain five different specially aligned blades. The blades are positioned close together. This enables you to have a close and clean shave, without any hassles. You won’t have to apply strong pressure to get the best shave. Simply hold your shaver normally, there is no need to press hard. The shaver can be used wet or dry, over the sink, or in the bath or shower. Its body is impervious to water, so that moisture and water will never reach its mechanics. You can still use your Braun body shaver dry, and it’ll conveniently smooth out any skin regions that you want to look perfectly groomed. But using wet will maximize your shaving experience, so you can shave closer down to the root. You can also add shaving creams, lotions, gels, and foams, to help expedite the shaving process. The use of gels, etc. will keep your skin from feeling irritated after shaving, or from looking red. Being able to use the shaver wet enables you to shave more efficiently, and capture more hair in one stroke. The Braun body shaver has been built with safety in mind. It’s not fun to shave and then have hairs tugged and pulled uncomfortably. Braun has built this body shaver with a small trimming element. 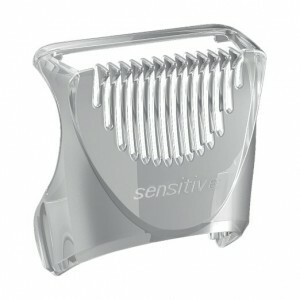 The addition of the sensitive comb is perfect for grooming those delicate regions of the body. The trimming teeth will minimize nicks and cuts on the skin, and prevent hair from being ripped out. The Braun body shaver can be switched into combi mode, which allows you to trim and shave long hair in one stroke. This helps to speed up your body shaver, so you get fast results. It’s also like having a two-for-one convenience in your personal shaver. The trimmer and razor work together to remove your body hair. First, the trimmer shortens the hair, and then the razor smooths away any stubble. 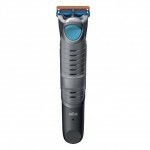 You can also switch between trimmer and shaving modes with the pressing of a button. Being able to trim and shave your hair in one stroke is a quicker and hassle-free way of shaving your body. This will help you to get ready faster in the morning, and get on with the things you need to do. The Braun Cruzer 6 Body Shaver will shave all body hair away, including on chest, under arms, legs, buttocks, back, and even down under. You can’t choose your genes—you inherited all that hair from your dad—but now you can do something about it! The Braun Cruzer 6 Body Shaver is easy to hold, even when it’s covered in soap and water in the shower. It’s designed ergonomically, and allows you to quickly shave all body parts. It’s perfect for those body parts that may be hard to reach, such as the shoulders. 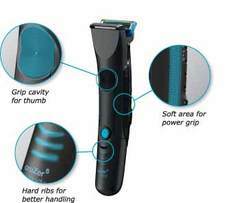 It’s designed with grips, so that you can grasp your shaver better. There is an oval blue thumb grip, a long blue strip for a power grip, and a hard ribbed grip for better handling. The body of the shaver has an LED indicator, which will let you know when it is charging up. It comes with its own charging stand. Once its fully charged up, you will have fifty minutes of full shaving time. There are three different trimming combs that come with the Braun Cruzer 6 Body Shaver. You can choose the one that best suits your hair, whether it’s light and short, or long and thick. The trimming combs included are sensitive, medium, and long. The sizings can also be measured in millimeters: 0.6 mm, 3 mm, and 8 mm. Braun can give you a great powered trim. There are extra-small trimming teeth, about one millimeter long, perfect for sensitive regions. Each trimming comb allows you to choose the perfect length for your body hair. Some men prefer to leave body hair on their bodies, yet don’t wish it to be super long. Using a body shaver can help maintain the perfect look. The Braun Cruzer 6 Body Shaver is priced nicely, so you’ll be able to afford two shavers—one for face, and one for body. You’ll want to purchase the Braun Cruzer 6 Body Shaver as an essential part of your body grooming toolkit.